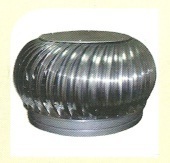 Prominent & Leading Wholesale Distributor from Chennai, we offer turbine air ventilators. We engaged in offering Turbine Air Ventilators, which finds its application for exhausting air from a room. It is operated by utilizing wind which is a non-conventional source of energy. Unlike motorized exhaust fans and passive ventilation systems which uses the conventional electrical supply, this system uses the velocity of wind for spinning of the vanes. At a low velocity breeze, the vanes of the exhaust system can spin and even after the breeze has stopped, the flywheel effect of the rotor cage will use its stored energy. This facilitates the exhaust system to work round the clock without any expenditure on electricity. The centrifugal force generated by the spinning vanes, creates a low-pressure region which helps in suction of the air. Air drawn out by the suction action is continuously replaced by the fresh air from outside. Easy to install, these ventilators have very low maintenance cost. Looking for Turbine Air Ventilators ?